Outside of who will be evicted, nobody really knows what is going to happen tonight. This special Battle Back episode that will be broadcast tomorrow night really throws a wrench into the proceedings. Will there be a HOH at the end of tonight, or will that be saved until later? If there is no HOH competition, how will they fill this hour? Confusing the situation even more is the fact that the feeds are at this time of writing down, and won’t be turned back on until after tomorrow’s west coast airing of the Battle Back episode. (Don’t get me started on that idiotic plan.) This opens up a ton of possibilities, including the potential of an endurance competition to take place tonight. Ugh, I wish I knew what was going on!!! Oh well, we still have a show to recap. As you may expect, tonight’s broadcast begins (after a Julie Chen intro) where we left off last night. Tiffany has semi-secretly put up Day to replace Corey as the Roadkill nominee. Yep, expect a lot of loud diary rooms moments in these first couple of segments. 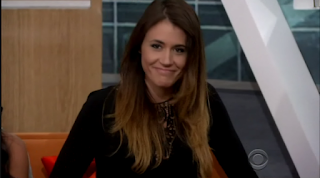 Day gets up and starts hugging people, but laughs in the diary room about being on the block. She doesn’t think she’s the threat that others are claiming. Tiffany is pissed that Day flipped her braids on her (ugh), and talks about it to Frank. “She’s already cracking”, Frank replies. Sitting outside, Day tells Zakiyah that Tiffany won’t even sleep in the same room as her. Paul the narc tells her that Tiffany was complaining about whipping her braids. Day admits that she did purposely do it. 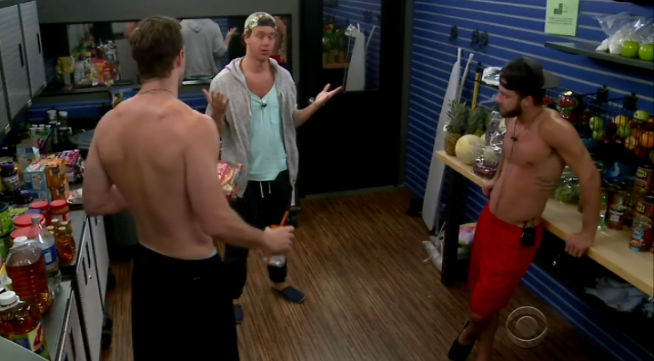 In the storage room, Paulie talks to Corey and Frank about who to go after. Frank wants to go after Day, but Paulie says Tiffany has to go now. Frank says they don’t have to worry about Tiffany in the future because she’ll just go against the girls. Even stupid Corey can understand that point. Now Tiffany tries to chat with Nicole. She complains about all of Day’s lies, and points out how Day cries whenever she “has stuff to hide”. She also talks about how Day told her about the couple’s alliance. “That’s not even true”, Nicole lies. Tiffany says that they should trust somebody who has never lied over somebody who always lies. Next she tries to work on Paulie. “I swear on anything that I wanted to work with you so hard. LIke I feel dumb because I let somebody else play me like a little rag doll.” She tells him everything that Day has told her, and now Paulie supposedly is worried because “it’s a matter of time before she tries to blow me up”. Tiffany says that he’ll never be her target, and she’ll go after anybody he wants her to target. Paulie now claims in the diary room that he’s now worried about Day. There’s a kitchen fluff scene involving knives that includes Tiffany, Paulie, and others. Day is pissed, and goes upstairs complaining about this “kumbayah session” downstairs. Yep, it’s time for the return of paranoid Day. They (Day, Zakiyah, Michelle) notice that Tiffany even has Paulie’s hat on. Back downstairs, Day has a chat with James. He’s her “right hand man”, and she tells him that they have to break up the showmances. “I’m in a showmance”, he replies. “Not you.” Day says the other fake relationships are “too powerful”, but again James worries about his own showmance. “You’re at the bottom” of the list. Oh James. In the storage room, James then tells Paulie what Day told him about getting rid of couples. “This has confirmed all suspicions I’ve had about Da’Vonne...it’s making it really hard to make a decision on which one I want going home”. Time to take a nice little bowel movement as “I’m going to call them out” Cody is on my screen. Along with Tiffany’s manic-fuelled sister. No thanks. It’s bad enough we have vets on the cast. We don’t want to hear from the ones not on the show. With that awfulness over, it’s time for the eviction. Since there’s no drama here, I can only hope that Tiffany has another crazy final plea. Day is first, and after thanking God she babbles about trust. “Thank you in advance for saving” my life. Natalie stands and says nothing but how she’s so glad to meet everybody “especially James”. Otherwise, I have no clue what she said. Tiffany then stands and says she’s had a great time but has “played a loyal game...just trust your gut and go with what is best for your game”. Hmmm, underwhelming. Voting starts with Michelle, and she obviously goes against Tiffany, as does Zakiyah, and James before we go to commercials. 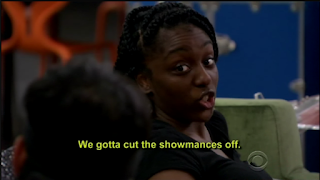 When we return, Nicole votes to evict Tiffany, as does Frank (what? ), Corey, Bridgette, and Paul. Yep, it’s unanimous. Tiffany is history...for now! Julie announces the results, and she’s out the door! The interview starts with Julie asking about her going against those that saved her last week. We again hear the whole Day/Frank story, and “the people I trusted the most were my enemies in the house”. Julie claims that she was in a solid place (what? ), and Tiffany said she had planned to play a low-key game but discovered she was “aligned with the wrong people”. Having her sister in the game did hurt her “a little bit”, she admits, “but after awhile I got my own sense on how to play the game myself”. She says that if she could do it again, she wouldn’t be so emotional. OMG, we get great news now!!! NO MORE TEAMS!!! It’s about time!!! After the last commercial break, there’s a recorded bit among those already evicted. Yeah, they all want back in the house. Same old stuff as always. So that’s it for tonight! Tomorrow we find out just who is returning to the house, and hopefully who is the new HOH!!! What did you think of the episode? Happy that the twists are over? Happy that Day was saved? Who do you want to see come back? Chat, kids, chat!!! I pray to the REAL Messiah that little messiah never returns! Was the Natalie and James segment just there to give Natalie some screen time just in case she got evicted? I also counted Natalie using the term "America" 4 times in that segment, so I guess James is coaching her on how to get Fan Favorite.